Meld marriages and be first to reach 1000 points! 1000 is one of the most popular Polish card games and it is well-known throughout other eastern European countries, such as: Russia, Belarus, Ukraine, Kazachstan, and Lithuania. The game is based on another game called Mariage, which is the French word for marriage. It refers to pairs consisting of two cards (Queen & King) of the same suit. The first one to collect 1000 points wins. Everything depends on the accuracy of a player's bidding and cleverness of his/her gameplay. Bid wisely and get 1000 points as soon as possible. Calculate values of cards and plan the current deal. Get pairs of Queen & King and meld them to get bonus points. Feel the adrenaline of great Eastern European game. 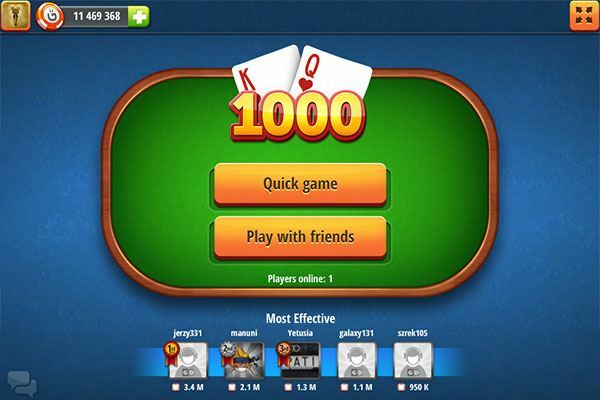 Thousand is, after poker and rummy, one of the most popular card games in Central and Eastern Europe, especially in Poland, Belarus, Ukraine, Russia, Kazakhstan and Lithuania. Few know that the key element of the game, the “marriage” was invented by... Poles. The game of thousand, or rather its basis, was described in the nineteenth century by the famous poet Adam Mickiewicz in Pan Tadeusz. The heroes of the poem played at the time the game mirasz, the name of which comes from French and means marriage. Such “marriages” are the key in the game of thousand. Playing the game of thousand: what's in a marriage? If you count on cards for luck, while playing the game of 1000 you should endeavor especially to make marriages. They allow you to earn the most points. They rely on finding kings and the queens of the same suit. In addition, you will often announce the union with the word “marriage”. The probability of getting a marriage at the very beginning of a game is 22%. A marriage of the suit ♠ gives 40 points, ♣ is worth 60 points, ♦ yields 80 points, and ♥ offers 100 points. After a player produces a marriage, all the cards of the marriage suit become trumps, bettering the cards of all other suits for the rest of the hand or until there is a new marriage. Extra points are earned by the cards on the table when each player plays their card. Playing the game of thousand looks slightly different in different parts of the world where there are different points values for the suits. 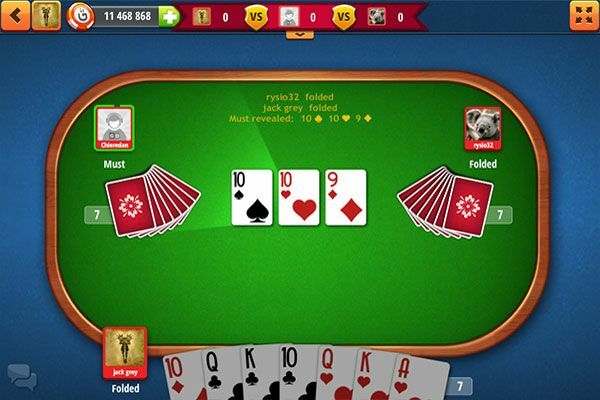 There are no such differences in the game of thousand online version, where the rules are unified so that everyone can understand them with ease and attempt to win even one game. Deal and bidding. 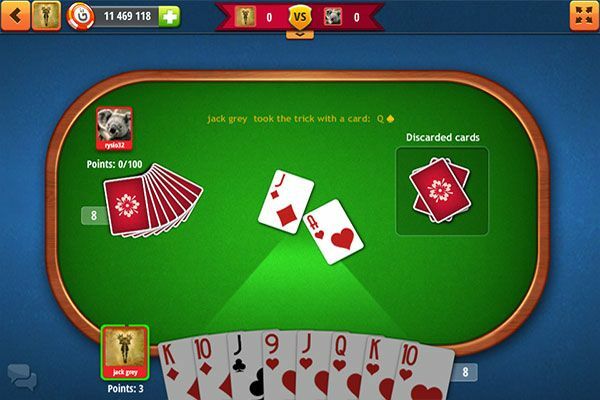 The players, based on their cards, estimate how many points they can earn with the hand. 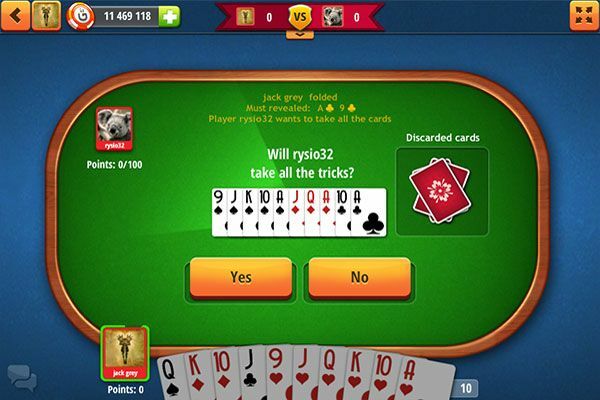 Withdrawal – it is possible for the player who won the bidding to withdraw from the hand. Choose the gameplay level for the game of thousand. Play. Remember that if at the end you lay the strongest hand on table you collect so-called tricks, as you earn extra points. The game of thousand online, which you can play at GameDesire greatly facilitates the last stage by flawlessly and quickly counting up your points. It means that a player can focus on choosing the appropriate strategy and defeat their opponents quickly. Rely on marriages - for a pair of kings and queens of the same suit you get extra points. Be sure to adopt a specific strategy - if you remember exactly what cards your opponents hold, you will be at a big advantage in the later stages of the competition. Get 1 000 points and defeat your opponents!